This will include all the basic configuration files and the parts needed to get the module up and running. We have a kit that contains most of what you need. No programming needed, all you need to do is drag and drop the sound files onto the device or a microSD card and apply power. Easy and powerful sound module that can work with any computer. Pulse interruptible one-on-one playback: (This is the default mode) In this mode, a single negative pulse will start playback. It is possible to interrupt the playback by pressing the same button used to activate. Once playback is interrupted, it will automatically restart the audio file immediately. It’s also possible to interrupt the play back by pressing any of the other 3 buttons. Once playback is interrupted, it will automatically start the sound that is associated with the button pressed. Level hold loop playback: In this mode, the negative pulse must be held/maintained to the sound module trigger for audio file to complete. The audio file will only playback while button, or negative pulse, is held/maintained during playback. Once the button being held, or negative pulse, is removed, the playback will be stopped/cancelled. If the button is kept holding, when the playback of the audio file is finished, it will start to play it repeatedly (loop playback). For example use a toggle switch to keep playing an audio file for as long as the switch is toggled to ON position. Pulse non-interruptible one-on-one playback: In this mode, a single negative pulse will start playback. It's not possible to interrupt the playback by pressing the same button or the other buttons. Once an audio file is triggered, the audio file will not be able to be interrupted/cancelled during playback. The playback will only end when the audio file has played its entirety. Standard MP3 key mode playback: In this mode, the buttons K1, K2, K3 and K4 will function as Previous, Next, Play/pause, and Stop respectively. In this case not like the other 3 trigger modes above, more than 4 audio files can be placed. Formatting the SD card deletes all the data off of the card! PLEASE NOTE: Save all the files from your SD card that you want to keep to your computer before following step 3 and 4 below. Formatting the SD card deletes all the data off of the card! In the Format window make sure that the correct File System is selected. It should be set to FAT32 for 32GB SD cards and EXFAT for 64GB SD cards. You are now ready to copy your MP3 files and configuration file to your SD card. 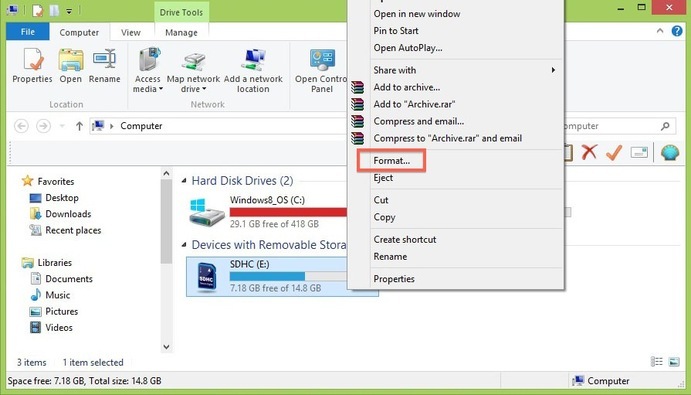 Connect the SD card to your computer by using an external card reader. Save all the files from your SD card that you want to keep to your computer before moving to step 2. Formatting the SD card deletes all the data off of the card! Note – If you’re using a Micro SD card, please insert the Micro SD card into the SD card adapter that came with card. 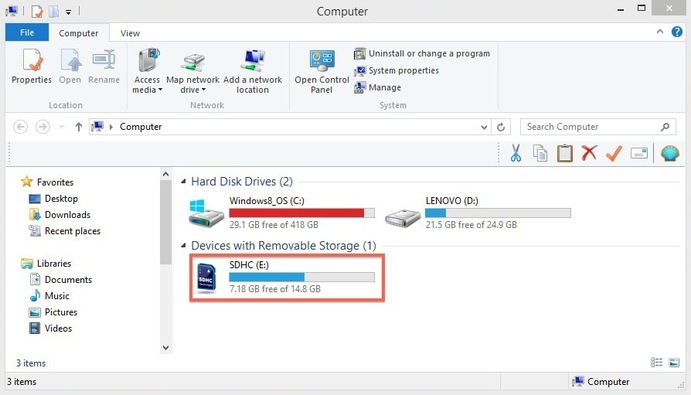 Connect the SD card adapter to your computer by using an external card reader. Also note – Mac OS 10.6.5 or earlier does not support exFAT format, which most 64 GB SD cards are formatted to. This means that you won't be able to format or use exFAT card on your computer. In this case, we'd recommend either upgrading your OS to 10.6.6 or later, or using an SD card that's already formatted to MS-DOS (FAT) or FAT32 to complete the below steps. Next, click on the “Format” dropdown menu. 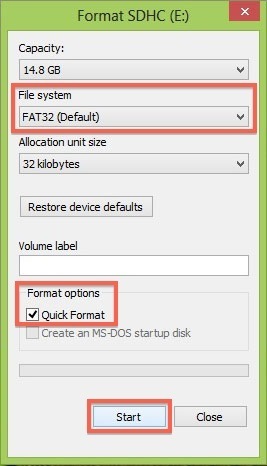 Select “MS-DOS (FAT)” if the card is 32 GB or smaller. If it’s a 64GB card, please select “ExFAT”. A message will appear asking, “Are you sure you want to erase the partition “[YOUR SD CARD NAME]?” Click “Erase”. Now the computer will delete the contents of your SD card and format it. You’re all done.